Boulder, CO, USA: GSA is taking action on its long-standing commitment to diversity and inclusion in the geoscience community. From its recently penned Events Code of Conduct (http://www.geosociety.org/GSA/Events/EventConductCode/GSA/Events/Conduct.aspx), approved by the GSA Council in September 2016, to services and training provided at the Annual Meeting by a professional facilitator on these relevant topics, GSA is committed to building a safe, universally accessible, and welcoming environment for all geoscientists. Saturday, 21 October. One-day trip. The GSA Diversity in the Geosciences Committee invites all to attend a reception to share ideas and celebrate diversity with the geoscience community. The 2017 On To the Future awardees will be recognized with a special keynote from the 2017 Bromery Awardee. Appetizers and a cash bar provided. Tuesday, 7:15-10 p.m., Palomino Restaurant, 1420 5th Ave, Seattle, WA. WSCC, Sunday, 22 Oct., noon-1:30 p.m.
GSA President Isabel Montañez will give her Presidential Address, titled, "Mind the Gap": GSA's Role in an Evolving Global Society. Top awards will be presented to luminaries in the field. WSCC, 23-25 Oct., 12:15-1:15 p.m.
– Monday: Award-winning author, David B. Williams, speaks on, "The Protean City: Reshaping the Seattle Landscape." – Tuesday: John (Jack) Shroder, Senior Research Scholar, Center for Afghanistan Studies, University of Nebraska at Omaha and 2017 Halbouty lecturer, speaks on, "Afghanistan Resources: Rapacious Extraction, Ruined Environments, and Chaos Continuation?" – Wednesday: Laurance Donnelly, Chair, International Union of Geological Sciences, Initiative on Forensic Geology, speaks on, "Forensic Geology: The Applications of Geology to Police and Law Enforcement." GSA provides a "self-care" room for attendees' comfort and convenience, available for personal needs during the meeting. GSA is continuing its 10+ year tradition of providing childcare options for families onsite, and will be adding a Junior Geologist option for children accompanying parents to the meeting. Find out more onsite at Registration or the Annual Meeting Office, WSCC Room 401. 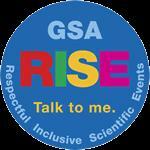 Incidents and concerns around issues of harassment onsite should be reported to a GSA staff member or leader wearing a GSA RISE button (http://www.geosociety.org/GSA/Events/EventConductCode/GSA/Events/Conduct-intro.aspx). Reports may also be emailed to [email protected] or given by text or call to +1-720-507-7523.